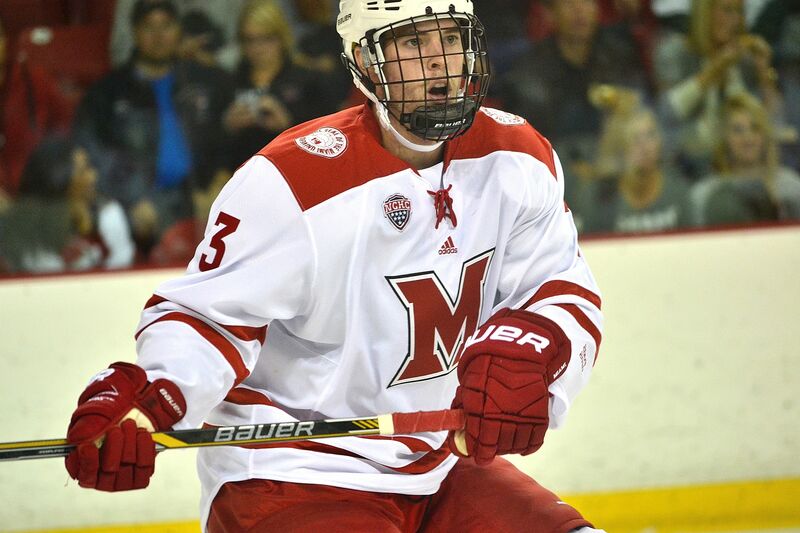 OXFORD, Ohio – Miami hockey has not seen a large number of transfers, and even fewer switch colleges from New England to become RedHawks. And although former Boston College defenseman and Montréal Canadiens draft pick Colin Sullivan has battled injuries throughout his collegiate career, he is completely healthy for the stretch run of his senior career. Sullivan originally committed to Yale while playing for Avon, a prestigious prep school near his hometown of Milford, Conn. He and his family decided he should remain at Avon to complete his high school years, and he decommitted from Yale and signed with Boston College. He joined the Eagles in the fall of 2012, a year after being selected in the seventh round by Montréal. Sullivan logged 32 games with Boston College his freshman season, but playing time was an issue and he decided to pursue other options. Transferring players have to sit out for a season, and Sullivan joined USHL Green Bay while in limbo, accumulating a pair of goals and six assists in 41 games during 2013-14. Fortunately for the RedHawks, a former MU forward contacted Sullivan and played a key role in bringing him to Oxford. In prep school, Kevin Morris played for rival Salisbury with Sullivan’s best friend. After his redshirt year, Sullivan was ready to contribute as a sophomore. But after dressing for three of Miami’s first four games in 2014-15, he was shut down with a recurring groin injury. “It was just so frustrating to come so close, to being in the lineup again, and all in the sudden you have to take your foot off the gas pedal and go back to square one,” Sullivan said. Sullivan logged just nine games his sophomore season, picking up a lone assist in the best-of-3 home playoff series vs. Western Michigan. Wingels, a defenseman himself and brother of Ottawa Senators forward Tommy Wingels, tried to help Sullivan through his transitional period. Colin Sullivan as a sophomore (photo by Cathy Lachmann/BoB). “I think he had a unique experience at Boston College, and he lost some confidence there,” Wingels said. “And I was just telling him that he needs to play his game. Boston College is a great hockey school – they have the history that they have, and he was clearly good enough to be able to commit there – so it was just a matter of getting his confidence back, because he clearly has it in him to be a good player at this level. Sullivan celebrates his only career goal vs. Providence in 2015-16 (photo by Cathy Lachmann/BoB). Junior year started off with plenty of promise, as Sullivan scored his first college goal in the season opener vs. Providence, juking a defender in the slot before burying a top-shelf wrister. But after going under the knife for the fourth time for his groin injury, Sullivan said he tried to come back too soon, as he was limited to six games the first two months. Fortunately he was healthy for the second half of 2015-16 and was in the lineup 15 times. Last summer was the first in three years that Sullivan did not require off-season surgery, but he still had trouble getting back on the ice. He did not dress for five of the RedHawks’ first eight games last fall. Sullivan celebrates a goal by fellow defenseman Chris Joyaux (photo by Cathy Lachmann/BoB). His attitude and hard work eventually paid off. Finally, nearly four years after transferring from Boston College, the search for more ice time that drove him to Oxford is coming to fruition. Sullivan has played in 20 consecutive games and has three assists, all in his last nine contests. And that confidence that earned him an NHL draft pick and a spot on Boston College’s blue line is finally back. He picked up helpers in back-to-back games for the first time in his Miami career on Dec. 31 at Ohio State and Jan. 6 vs. St. Cloud State. Sullivan also earned an assist on Willie Knierim’s game winner vs. Western Michigan on Jan. 28 with a well-placed stretch pass. Making Sullivan even more useful to the team is his ability to play forward. He has been listed on the fourth line several times this season, enabling the team to dress a seventh blueliner. Colin Sullivan as a senior (photo by Cathy Lachmann/BoB). Sullivan and classmates Wingels and Justin Greenberg have become close friends at Miami, and both said one of his best personality attributes is his sense of humor. Both Wingels and Greenberg have gone through their share of injury issues as well, and Sullivan’s positive attitude has helped them deal with their respective issues. Greenberg said he also noticed the improvement in Sullivan’s game as the months have passed since his injury. Sullivan is also a favorite among his hockey peers, according to Greenberg. 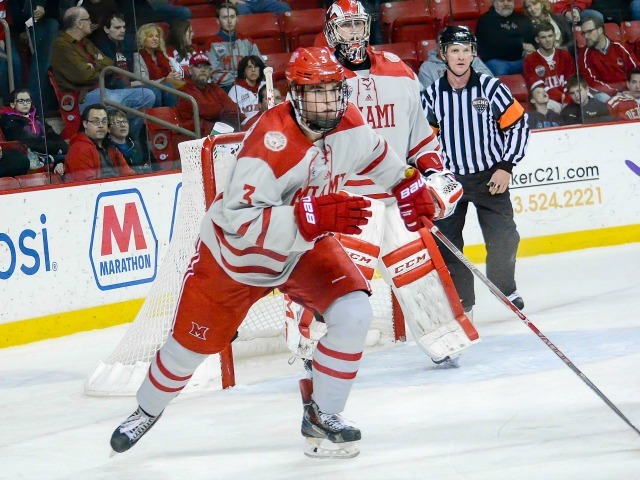 Now healthy, Sullivan would like to continue playing hockey after he graduates this spring. He is a history major with a minor in entrepreneurship, boasting a 3.3 grade-point average. But in addition to his ultimate pursuit of a traditional job, Sullivan plans on joining the military for four-plus years, and is especially interested in special forces. Though everything hasn’t worked out as Sullivan had originally planned when he moved here from New England, transferring to Miami is something he has never regretted. The most hated school in the land Boston College Eagles announced today that Brad Bates will be their next Athletic Director after 10 years in the same position at Miami. Unless you’ve been living under a rock, you know that Miami doesn’t exactly like Boston College because of recent hockey defeats at the hands of the Eagles. As the Miami Athletic department scrambles to find a new Athletic Director and faculty member (he taught undergrad and graduate courses in sports administration), let’s take a look back at a few highlights in Brad Bates’ 10 years in Oxford. Our beloved hockey team won a Central Collegiate Hockey Association regular season championship and Miami’s first Mason Cup as CCHA tournament champions. 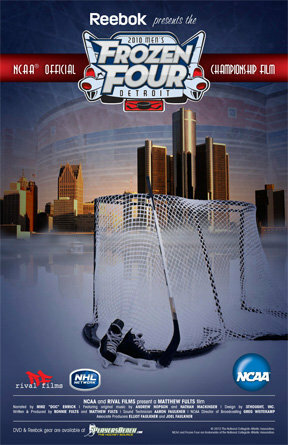 Appeared in two consecutive NCAA Frozen Fours, including the national championship game in 2009. On the hardwood, Bates was highly criticized for allowing Charlie Coles to stay in Oxford until his retirement last year, and has recently hired John Cooper as Coles’ replacement. Bates also helped raise student-athlete graduation rates. His overall Graduation Success Rate (GSR) of 89 percent in 2011 was near the top in the nation. With Miami’s search will also come some uncertainty from Oxford. Of course, there’s the issue of replacing Bates with new blood, but several other questions are also raised. Will Miami’s commitment to the hockey program continue? 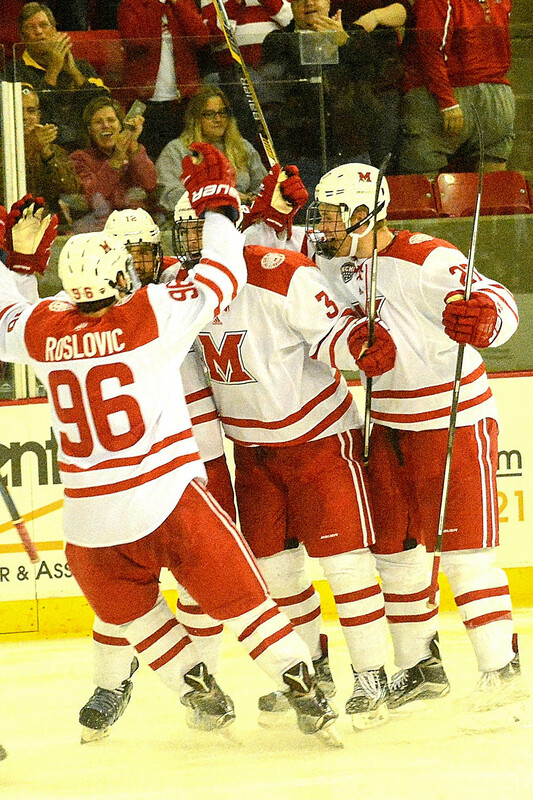 Will funding be pulled because Miami Hockey is roughly a break-even sport? How will this impact our commitment to the NCHC? Will the new man on campus put a renewed focus on basketball and football where it is sorely needed? With a new AD, the possibility exists that existing coaches will be less than pleased with the new leadership. Is this the push Coach Blasi needs to jump to another hockey program, or perhaps the NHL? Does anyone else think that Brad is awfully excited to get out of Oxford? Before his press conference today, Brad had already created his new twitter handle (@BCBradBates), he met the hockey team before their practice today, and then spoke to their 1-4 football team after their practice. I’m not saying good riddance, but good riddance. Let the search begin. We suspect Steve Cady may be a leading candidate, and some have suggested that Jason Lener may be near the top of the list as well. Lener is a former RedHawk Deputy Athletic Director and current Illinois Executive Senior Associate Athletic Director. In any event, we hope that the next guy for the job is a hockey fan!